Donors will be listed HERE! Hardware donations are also welcome, email me using the contact form! Once again, bots have been trying to infiltrate my forums. Once they've registered, they find they can't post any URLs, so bot spam posts have been low... however, it's annoying receiving many emails about failed registrations (the bots insert email addresses that are invalid), so I've added some logic captchas to the registration page. This should make it harder for bots to sign up. Let me know if you have any issues with registering on the forums. As promised, here are the new versions of Home and Pro editions. You can read about the Home version Here and the Pro edition Here. As usual, you can grab the downloads from Here. Thanks to those who reported the issues with the Home edition! Remember, feedback is important to me. It seems that Home v7.0 has an issue with its /etc/fstab file where it tries to mount /dev/hda2 instead of the loopback file when booting from E or F drive. Pro v5.0 has symlink issues in /usr (from the old days of XFree86). I'm currently uploading new versions to fix these issues. Sorry for any problems caused! Well, it's been about 21 months, but here they are... the "You're still doing this?!" releases. I don't really know if there's any demand for Gentoox anymore, but I figured I'd put these out there just in case people do still use it. Home edition has been upgraded to v7.0, Pro to v5.0, Resctoox to v6.0 and Sparkle to v4.0. You can grab the downloads from the Downloads section. Fully synchronised software (both with magic and portage as of a few days ago). Ditched RAR file format in favour of tbz2 (file sizes are slightly bigger, but it's free!). 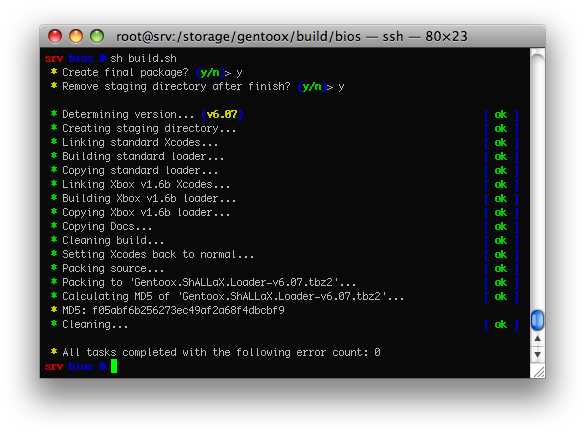 Updated Busybox in all initrds. Ditched KDE, only XFCE is available now (KDE was way too bloated). Upgraded to latest 2.4 series kernel. Removed deprecated packages and replaced with modern equivalents (XF4VNC => X11VNC, GAIM => Pidgin). But what about MCE v2.0? Well, rather than delay all other releases, I decided to put everything else out while I rework MCE. The new version of MCE will take quite a while to finish (I haven't even started yet), but the main feature will be bringing it inline with the other distributions whereby installation can take place natively or in a loopback FS. So for now, enjoy these releases. They may take a while to spread to mirrors, so if your download doesn't work initially, please try again later! I knew I had these backed up somewhere! It'd help if I checked my backup location more thoroughly in future. Oh well, I have better scripts now, anyway! Looks like the bots are back to spamming the forums since I've upgraded them. To combat this, I've coded a feature to disallow certain types of posts depending on the poster's age. For those of you who were following the MrModchips court case (basically, a case against the owner of the website stating that his devices were solely used for the purposes of circumventing copy protection) - he has appealed successfully and had all charges dropped. This is great news for the modding community as it makes Linux easier to run on devices which need such a mod chip. Believe it or not, Gentoox is now 5 years old! 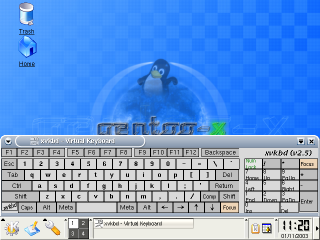 Gentoox Linux is an adaptation of the popular source based Linux distribution called Gentoo. It retains all the features of the original (portage, sysvinit etc...) but has a patch system created from the ground up, by myself, which is specifically designed for Gentoox. "Magic" (as I have labelled it) allows users to install new software, upgrade their kernel and fix bugs. To learn more about magic, run "magic usage" once you have installed Gentoox. Gentoox runs along side games - you get 3 choices during installation: E, F and Native. Both E and F create a loopback filesystem meaning that none of your drives are formatted during installation (except for cache partitions). If you choose "Native", then your F: partition is formatted to ReiserFS (making it inaccessible to Xbox applications). Gentoox can be loaded via a .xbe file, or from a Cromwell based BIOS (which can be flashed to your modchip during installation). When using E or F installations, you are totally risk free - if you dont like Gentoox, simply delete all the files it installs (about 7 in total) and its gone. There are three versions of Gentoox: Pro Edition, Home Edition and Media Center Edition. All three are 100% free and opensource, the difference between Home and Pro is that the Home Edition has many software packages preinstalled and preconfigured for instant usablity straight out of the box where as Pro doesn't even have a graphical user interface let alone any "useful" applications. Pro is a bare minimum installation for booting the system, the entire customisation of the OS is left in the user's hands with Pro. Media Center edition is more of a "Plugin" than a separate distribution. It allows you to have a Media Center along with Gentoox Home or Pro.